Circuit of the Americas has a population of feral cats, as many large places tend to attract. Alanis and I went looking for COTA’s cats once and found none. But now Renault—beautiful Renault—put the cats on their Formula One car. We’ve found the cats! The cats are here! Rejoice! Cats! As a website, we’re all but required to love cats. Jalopnik itself was born of the internet, and the internet loves cats. 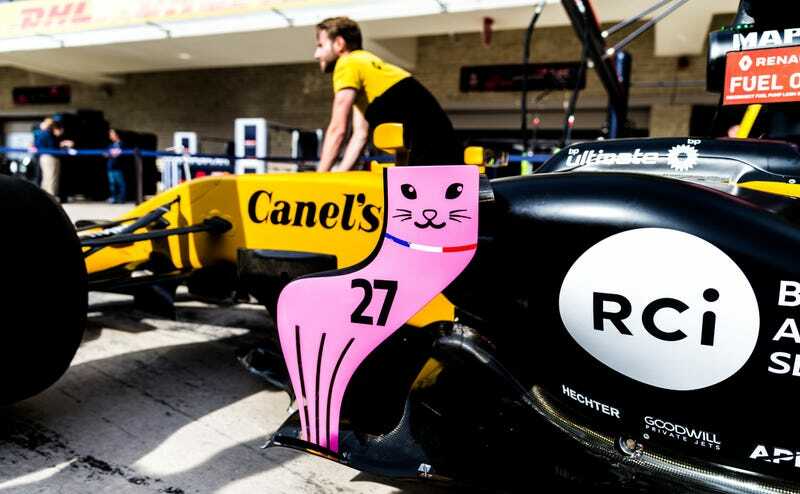 Renault painted their car’s turning vanes pink and deemed them the Aerocats. Pink, of course, is no doubt part of the wider em-pink-ening of the track in support of the Susan G. Komen breast cancer charity. They are by far the loveliest, happiest addition to a Formula One car I’ve ever seen: cute, but functional. Correction [9:50 a.m.]: A Renault representative referred to this piece as a turning vane, not a barge board. This has been corrected above.